The evening's act was Kray Van Kirk, whose 12-string guitar and soaring vocals were spellbinding. The Alaskan singer-songwriter, in his Edinburgh debut, was not the reason I arrived early, but was certainly why I stayed late." 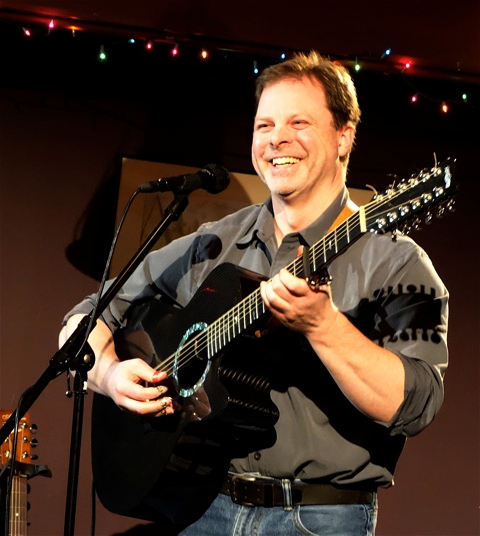 A fine finger-style guitarist with a precise baritone reminiscent at times of Gordon Lightfoot, Van Kirk has a Ph.D. from the University of Alaska. After five years of living in his van and playing music across the US and Canada, he thought that a career in the sciences might be a bit more secure than playing music for a living, especially as a single parent. Eventually, however, he realized that he liked writing songs more than statistical models, and he put aside his computer (and salary), picked up his guitar, and set out again. Thus his songs: Thunderbird resurrects the Phoenix in an empty desert diner somewhere in the American Southwest (yes, the Phoenix drives a Thunderbird), The Queen of Elfland plucks Thomas the Rhymer from the English-Scottish border in 1250 and drops him, along with the Queen, into a subway car, and The Midnight Commander has an insane, Quixotic old man leading the city of New York to take up arms (and underwear) against hatred. Opening for John McCutcheon, Salt Lake City 2014 after winning the Suzanne Milsapps Performing Songwriter contest.